February 22nd, 2017 (9:12 AM). Edited February 28th, 2017 by Sergeant Doof. Hello there! My name is Antoni and I had been working on a rom hack for year, although never getting around to finish it. If I upload it here and people enjoy it, perhaps I may get the motivation to complete it again! *4 starters to choose from. *Gen 4, 5 and 6 Pokemon. *6 Gym badges to collect. *Around 20 in-game hours of play time. *Unique battle and overworld sprites. Thanks to Kyle (Private Goof) for making some textures. Other than that, the entire ROM is made by myself. Thanks for reading! If you're Interested in downloading the hack, The links are below. You need to patch the ips file with Lunar IPS to an existing Pokemon FireRed ROM. If it puts you in a bad financial spot, PLEASE do not donate, people in the past have just requested for it. February 24th, 2017 (8:00 AM). Looks like some good work was put into this. Shouldn't this be in the progressing section if it isn't finished yet? Credit to Corazon(or whatever he calls himself now) for banner. February 24th, 2017 (11:48 AM). February 24th, 2017 (12:13 PM). I can't choose a starter Pokemon. Also you didn't script to prevent me from going south of the town into the grass without a starter. A mind is a terrible thing to waste. And a gross thing to recycle. "Too much water" - IGN, The most hypocritical statement of all time. February 24th, 2017 (1:19 PM). Yeah I'm not sure why you can't pick a starter, but thanks for pointing out the bug. February 24th, 2017 (9:12 PM). Yeah, I encountered that as well the first time. Second time around, I went directly to the lab without interacting with anyone or going south and I was able to choose my starter. 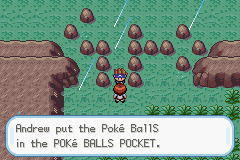 I guess getting the pokeballs before your starter messes something up. February 25th, 2017 (6:16 AM). Looks promising! When do you plan to finish this? It's already looking to be one of the better hacks. February 25th, 2017 (8:33 AM). I have no idea when it's going to be finished, as I am the only one working on it, but hopefully sometime in late 2017. February 25th, 2017 (4:10 PM). I don't understand the point about the gym announcer telling me about ground types since as far as I can tell, nowhere can I catch a ground type before facing Ray? February 27th, 2017 (5:16 AM). I don't see why he can't tell you advice on what pokemon are good against electric even though you cannot catch one, but good point. February 28th, 2017 (5:23 AM). Are you going to add gen 4-6 moves? February 28th, 2017 (12:52 PM). There already is! Aura sphere, draco meteor and play rough to name a few. February 28th, 2017 (9:36 PM). Pokemon Franicum is great Sergeant doof but you want to fix the Bugs in the Game. March 1st, 2017 (3:13 AM). Yeah, that will be my main priority moving forward, I just need to know what bugs there are. March 5th, 2017 (9:33 PM). I encountered a pretty mean bug where my game turned all kinds of different colors and froze on me when I went to heal at the Pokemon Center in the town after the first gym (I forgot the name of it). I had a similar bug in another hack a year or two ago (I think it was Obisidian Black/Pewter White) and I still don't know what causes it. March 6th, 2017 (4:46 AM). Yeah, if it's not something to do with your emulator, it might be caused by remapping the healing centers since flying pokemon aren't in the game. But if the hack changed colors, that's pretty weird. If it the bug was caused by what I just said, the result would normally be a bunch of glitched NPCs standing still or doing actions in the center. Hard to explain but hopefully you know what I mean. March 12th, 2017 (5:05 AM). March 12th, 2017 (8:08 AM). Haven't figured out a way for that yet, probably through water stone if it burns down to it though. March 17th, 2017 (1:49 PM). They were lots of grammar errors and typos. Go check the spoilers for errors. "What the heck are you doing here?! 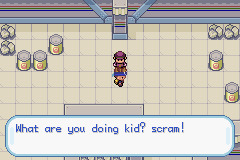 Scram!" "UGH! My Poison type Pokemon aren't strong enough!" This guy was irritated that he lost. Did he mentioned wild Electric types? If so, he says more like "UGH! 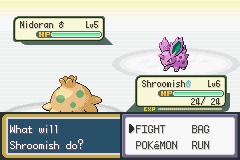 The Electric types here were such a pain..." Only because he have a Grimer and a Zubat. This Nidoran as an extra space. Darn it all? More like Blast it all! This is a script error. When you look closer, you see this player running. And by the way, There's a capital 'S' typo. March 17th, 2017 (5:02 PM). These aren't typos, what you've posted are just variants of the same message, they all make perfect sense in the context. 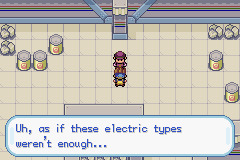 As for the electric one, the grunt is saying as if the electric type pokemon he had to deal with in the power plant weren't enough, the player just being the cherry on top. And the 'script error' I have no control over, that's just how the source code was programmed by game freak. Thanks for your effort though. March 17th, 2017 (5:34 PM). I apologize for mentioning typos. It's just I don't know what it means, is all. At least I let you know about 'Scram' right? In case you don't know 'Blast it all' mean. It means 'Shames a grunt badly in front of a player'. The text after each image are for editing, changes. 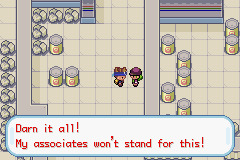 Except for the electric types to deal with. I should've told you sooner because I have a disability to communicate right. Changes like this: "What the heck are you doing here?! Scram!" August 1st, 2017 (1:47 PM). Hey, I died at the Gary battle south of the snowy city (don't remember the name) and got sent back to Slushwash grotto, before the missing rival scene. I cant re-trigger the cutscene. Is there anyway back to the snow town or am i SOL? August 1st, 2017 (2:01 PM). I'm pretty sure that if you talk to the peeps you can trigger the whole event to get to the snowy city again, I really need to fix that. October 8th, 2017 (12:03 PM). for when a new update of your game? October 23rd, 2018 (8:38 AM). Curious to ask if this hack is still on progress.